One low point about Indian Railways is cleanliness. It is not only the fault of Railways. How often we notice this…. in a compartment, when it is not so full, people feel it rightful and comfortable to stretch by keeping one’s leg on the opposite side seat, without ever realising that : a seat is meant for sitting not to place one’s dirty legs !... when people eat [be it timepass numkeens or tiffin or meals] – conveniently garbage would be kept below the seat ! Suburban train coaches are not all that tidy. Though coaches are swept every day after they are brought back from a day’s service, they are not washed at the stabling yards. TOI reports that 86 rakes operate on the three suburban routes and an MRTS route. But the railways has capacity to clean only four rakes each per day at its three EMU maintenance yards in Avadi, Tambaram and Velachery. The cleaning process becomes tedious because of shortage of workers and lack of modern mechanised cleaning. When trains are brought back after a day’s trip, workers engaged by contractors enter the coaches and sweep them, while a few mop to wipe away the grime and bills stuck on the exterior. Sources said, “The original schedule was to wash two rakes in the day and two at night. Avadi depot had a mechanised washing system, where a rotary brush was available. But it had to be discontinued after a few accidents. A new tender has been floated.” The design of EMU coaches — open windows, doors not waterproof, machinery and electrical fixtures inside — prevents use of water jets for cleaning. Metro rail coaches are waterproof with doors locked, allowing them to un dergo mechanised washing. A railway official said, “People often throw waste inside the train. It takes four hours to clean a rake. The volume of commuters on suburban train is also huge, while Chennai's metro is still at its nascent stage and does not get heavy footfall.More than 10 lakh commuters use 592 suburban trains and 132 MRTS trains every day , making them more vulnerable to practices that affect cleanliness. Moving away from EMU to regular trains – some would feel luxury in travelling in 1st Class and AC compartments where rugs are provided by Railways. Indian Express startles all with a report quoting Minister of State for Railways Manoj Sinha telling Rajya Sabha during Question Hour that while bedsheets, bed roll and pillow covers are washed every day, the blankets are washed every two months. His reply came to questions raised by various members of the Upper House regarding the quality and hygiene of laundry and linen supplied by the Indian Railways on trains. The Minister pointed out that while they have 41 mechanised laundries, plans are underway to increase their number by 25 more in the next two years so that these can serve about 85 percent of the passengers who use Railway linen and bed sheets. Not to end the post on ‘ dirty linen washing ’ – here is something good too – about Chennai metro. TOI reports of a gleaming metal body chugging out of Koyambedu metro station breaking the morning silence. With the rising sun, the first train of the day leaves its shed to ferry passengers across the city — and it spanking clean and shiny. 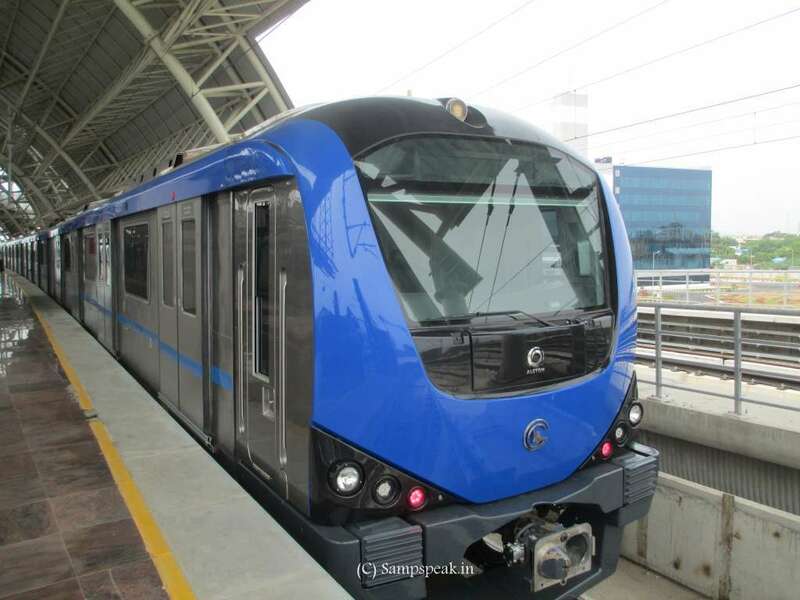 Chennai Metro Rail Ltd has a specially designed depot in Koyambedu for regular upkeep, maintenance and cleaning of the nine trains it operates. It has 12 maintenance lines and each can accommodate a six-car train. It takes barely four hours for three engineers to conduct a three-stage service for a four-car rake, about half the time and manpower required for a suburban train. Thanks to cutting-edge technology like an onboard diagnostic system that records all the faults in the train, weekly servicing is quick and uncomplicated. It is part of the Train Control and Management System (TCMS), similar to a ‘flight data recorder’ in an aircraft. TCMS records all instructions given to the electronic system by the train operator, while its diagnostic system records the faults “At the inspection bay line, we download the data log from the system, look for faults in the train and perform the required servicing,” an engineer said. According to the faults recorded by the system, the train undergoes a three-tier inspection. Engineers conduct checks under the train by walking through a pit underneath, and inspect the sides of the train and the roof using a foot-over bridge built across the depot. A list of 45 parameters like braking system, traction system and high-voltage system are checked and certified before they head for cleaning. A team of cleaners manually wipe the interiors of the train clean. In the third stage, sensors at the entrance of the ‘automatic train wash plant’ detect approaching train and send signal to the plant to begin the cleaning cycle.First, the car bodies are washed with water as the train moves at a speed of 3kmph. Brushes run through the exterior, rinsing detergent sprayed on them. The trains get a final round of washing with water from a reverse osmosis plant. Apart from being serviced once in three days, engineers perform quarterly, half-yearly and annual maintenance to ensure they last their life cycle of 30 years. Overhauling of the train is done once in four years. Next time, one cries over any increase in passenger fare, understand that only when the fare is commensurate, the neatness also could be maintained. It is for us to decide, what we want ! !